When I go to Makati, I use the MRT to get back to either Ortigas or Shaw. It’s the best way I could beat the northbound traffic during rush hour– Nevermind the countless of commuters with you. *sigh* I do hope, that when I get back there, the set-up would go back to normal. And oh, Nina! Are these the TVs at the railways you were talking about before? (Blue poles) Ahhh~ They’re new (I haven’t ridden the MRT for a few months already). And they’re showing music videos. When I was there, they were showing Martin Nievera vids. This was in Makati. 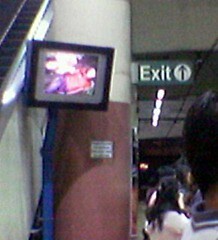 I also saw the same thing at Shaw station, on the way to the Shangri-la Exit.